Yes, this is a weird book. You’ll either love it for its quirkiness or shake your head at death being the main course on its pages. Of course it’s hard to get attached to our MC when he keeps getting killed. The dark humor throughout should appeal to mostly boys. The deaths are not graphically detailed and several happen in the course of a few pages, all in the same way. As I was reading it to myself, I thought this would be a great read-a-loud, especially for someone who could do voices well. 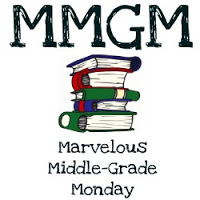 It’s a quick read that does include some challenging vocabulary words. FULL PLOT (From Amazon): Alexander Baddenfield is a horrible boy—a really horrible boy—who is the last in a long line of lying, thieving scoundrels. One day, Alexander has an astonishing idea. Why not transplant the nine lives from his cat into himself? Suddenly, Alexander has lives to spare, and goes about using them up, attempting the most outrageous feats he can imagine. Only when his lives start running out, and he is left with only one just like everyone else, does he realize how reckless he has been. The whimsical, okay… creepy drawings are perfect. They’re done by long time illustrator, Sophie Blackall, who also did the Ivy and Bean Series and two dozen other children’s books. The humor is not for everyone, but I did chuckle a few times . Nothing to hide here if you happen to accidentally open this book. I’d keep the little ones away. Definitely one for older MG. You know there are going to be deaths and they’re not going to be pretty as you imagine them. But some kids and adults can’t get enough of the macabre. I didn’t expect there to be a moral to this odd tale, but there it was on the last page. If you have read every Lemony Snicket and Roald Dahl book, this will be a story you’ll enjoy. …I suggest that you turn back now. You have hopefully enjoyed the story so far. Why not quit while you are ahead? 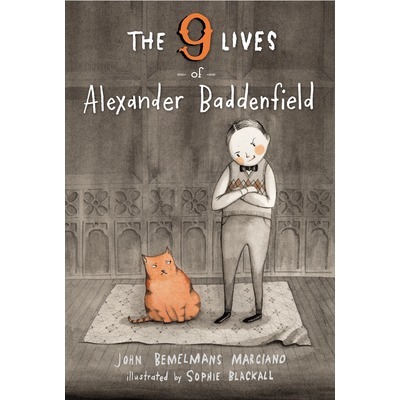 This entry was posted in Reviews and tagged John Bemelmans Marciano, Middle grade, Middle Grade Book Reviews, The 9 Lives of Alexander Baddenfield. Bookmark the permalink. These sounds more like the kind of book I’ll pass along than read for myself, though I’ll probably look it over quickly. However, I know some readers that would eat this up in one gulp! Thanks for bringing it to my attention! You’ve got to love that cover! I know a boy who would love this one. Thanks for the review. HI, Greg, the humor in this sounds like something I’d enjoy. Thanks for stopping by, J.L. !